Joy Forever, launched this fall, heralds the great come-back of Jean Patou on the scene of French perfumery. Founded in Paris in 1914, the legendary house of couture and perfumes survived the abrupt death of the man who gave it his name, in 1936, and kept on presenting haute couture collections until 1987. The house, fallen into disuse, joined the Prestige Beauty division of American giant Procter & Gamble (a giant big like this) in 2001, and was eventually bought two years ago by English group Designer Parfums. And, whereas P&G didn’t bother to collect the house’s archives – though exceptional ones – Designer Parfums intends to do just the opposite by sheding light on the amazing patrimony of Jean Patou, a designer and perfumer of genius intuition. The house, which still produces all its perfumes in Grasse, where it also has its own fields, has thus started to take the dust off some of the wonderful perfumes it created up to the 1980s. “We won’t create a brand new perfume until we have brought Jean Patou’s couture back to life”, Bruno Cottard, vice-president at Designer Perfums, was telling me just a few weeks ago. 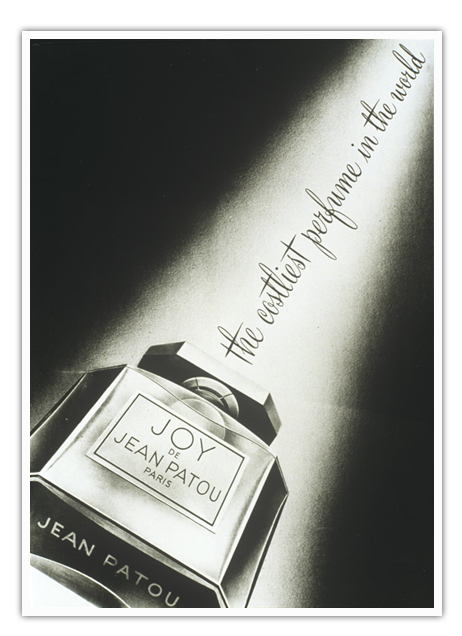 Deeply rooted in collective memory (ask your grandmas), still known as “the world’s costliest perfume”, Joy is Jean Patou’s most famous fragrance: it was conceived during a recession that’s not unlike the one we’re going through today. In 1929, while the crash of the stock market had led the world into an unprecedented crisis, Jean Patou, with the complicity of his perfumer Henri Almeras, conceived this luxurious fragrance as a gift he could give to the clients, more or less penniless, of his couture house. And he included an incredible amount of very expensive natural ingredients such a rose and jasmine from Grasse. Naturally, in-house perfumer Thomas Fontaine started by working on Joy: launched in October, Joy Forever is the contemporary homage he dedicates to this legendary perfume. After a fresh start, where acid and juicy bergamot and mandarin meet the green galbanum, we find the rose and jasmine notes characteristic of Joy. But this classic floral accord is enriched by the sweetness of orange blossom and the powdery sensuality of an iris from Tuscany, as well as a surprising, joyful, voluptuous note: peach. Joy Forever turns out to be a beautiful, modern composition, tainted with elegant classicism, quite far from the sweet and regressive juices many others try to force on the necks of today’s women. Jean Patou also had the genius idea to relaunch, under the name Collection Héritage, some of its most magical references. 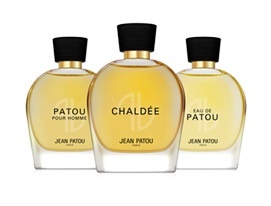 In November, let’s (re)discover Chaldée, Eau de Patou and Patou pour Homme. I have a real thing for Chaldée, launched in 1927: it is the smell of the very first tanning oil, created by the man who had also imagined the very first bathing suits. This man was Jean Patou. During the Roaring Twenties, on French beaches, one could smell the trail of his Huile de Chaldée, a beautiful floral bouquet made of orange blossom, narcissus, jasmine and ylang-ylang, spread out on an oriental base of vanilla, opoponax and tonka bean. And it is because women were crazy about the smell of this oil that he had the idea of turning it into a perfume. Eau de Patou was launched in 1976: inspired by the universe of sports, its freshness is timeless and unisex. Very zesty with top notes of lemon and orange, it relies on honeysuckle and galbanum for its fresh green notes. Then, it reveals its delicious, powdery warmth: lavender and ylang-ylang on a musky base, enriched with tonka bean. Launched in 1980, Patou pour Homme is THE great masculine by Patou, and I fell in love with its chypre base when I first smelled it very recently. The masculinity of the fragrance expresses itself in the fresh and spicy start, where zesty notes meet galbanum, pepper, cardamom (?) and remains elegantly intact when the floral heart of rose, lavender, jasmine and violet unfolds.